THIS ARTICLE CONTAINS A WALKTHROUGH FOR RAO WASTELAND. WE WILL UPDATE THIS AS WE GO ALONG. 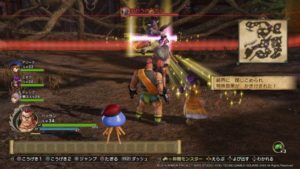 This page contains a walkthrough on the main quest “Rao Wasteland” in Dragon Quest Heroes II. Most of the terms here are based on the Japanese version of the game, so some terms may not be translated clearly. We will be updating this when the English version of the game comes out in April 25, 2017. Go north and head towards “Dalal”. Try to go to the previous area and a custcene will occur. Blue 1 will be opened after clearing the story mission in the map. Blue 2 will be opened after clearing the story mission in the map. There will be a geyser that comes out near Blue 3, so you need to avoid it by jumping. 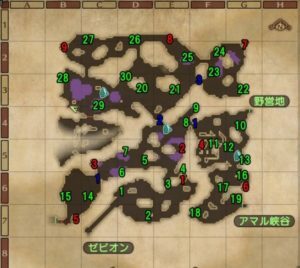 Treasure box locations are highlighted in red numbers. Numbers 10 and 11 are available at the back of the barrier. It is recommended that you are at Level 30 or more before facing Wight King. Since the boss’s defense is quite low, focus on attacking it using melee attacks. Avoid and dodge his long-range attacks and you will be able to defeat this boss easily. It is also recommended that you are at Level 30 or more before facing Demon-at-Arms. 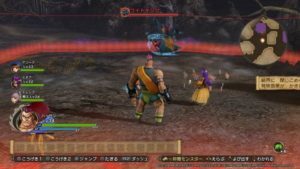 Since you will not be able to cause damage unless the boss stands in front of you or near you, make sure that your melee attacks could deal massive amounts of damage before dodging or avoiding his counterattacks. *The northern part in D4.